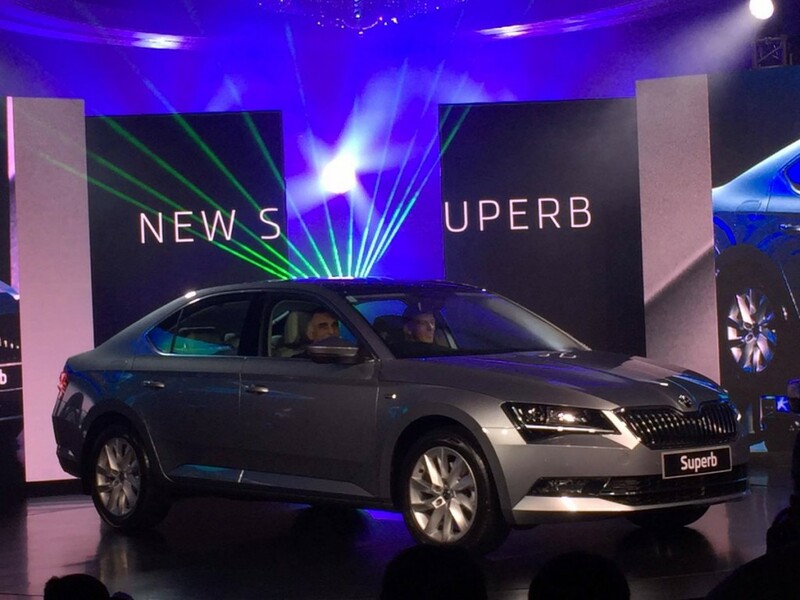 The much awaited 3rd generation Skoda Superb has been launched in India at base price tag of Rs.22.68 lakh. This all new Skoda model has been built on top of Volkswagen Group’s MQB platform which is used to manufacture premium sedan more lighter and offers a longer wheelbase. The new 2016 Superb comes packed with spacious cabin along with added equipment list, revisions to the engine line-up for better driveability as well as fuel economy. The car makes use of new design language and it is the company’s first ever model to be offered with adaptive Dynamic Chassis Control (DCC) with Driving Mode Select. In order to provide better fuel efficiency as well as the performance, the 3rd generation 2016 Skoda Superb has got some minot tweaks to the engine line-up that comprises of 1.8-litre TSI 16V DOHC four-pod petrol and 2.0-litre TDI CR 16V DOHC four-cylinder turbo diesel powertrains. The 2016 Skoda Superb is powered by various choices of engines in international markets, both the aforementioned units will be carried over from the outgoing Superb for India. There is a revised 1.8-litre TSI petrol engine which is capable of producing a maximum power output of 180 PS between 5,100 and 6,200 rpm and peak torque of 320 Nm for the manual and 250 Nm for the automatic variants. The diesel engine of Skoda Superb outputs a 177 PS of power between 3,600 and 4,000 rpm and has a peak torque figure of 350 Nm between 1,500 and 3,500 rpm. New Superb’s petrol engine comes mated with a fully-synchronized six-speed manual or a seven-speed DSG automatic with manual Tiptronic gear changing. The diesel motor transfers power to all the wheels through a six-speed DSG automatic with Tiptronic manual gear changing. Talking about the exterior of Skoda Superb 2016, Skoda Octavia was the first model to receive the Czech brand’s latest design language and the Superb follows those lines quite perfectly. 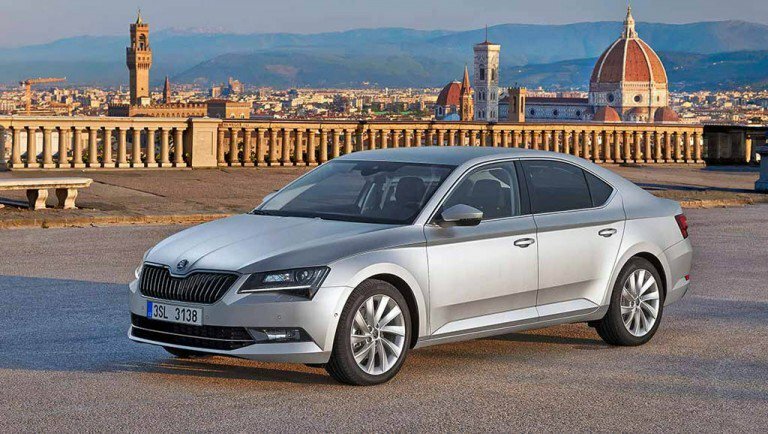 The 2016 Skoda Superb follows the latest design language which you find in Octavia. The car is built on the Volkswagen’s flexible MQB platform which you see in cars like VW Passat and Audi A3. The all new Skoda Superb shares over 50% of the components with the Volkswagen’s Passat model. The 2016 Skoda Superb gets the design inspirations from the Vision C Concept which was first showcased at the 2014 Geneva Motor Show, the new Superb gets an aggressive appeal alongside boasting a bolder stance with sharper body panels. The front fascia has been fitted with the signature wide butterfly grille that sits in the middle of sleeker 3D headlamps angled to perfection. The bumpers have been more sculpted than ever with horizontal LED fog lamps accentuate the appeal. Talking about the interior features of 2016 Skoda Superb, the car includes a 8-inch Smartlink touchscreen infotainment system which is based on Volkswagen’s MIB Technology ( aka Modularer Infotainment-Baukasten) that comes with triple-zone climate control, premium leather upholstery, heated seats, 12 speaker CANTON audio system, multi-spoke steering wheel with buttons for various controls, neatly laid out centre console, upgraded dashboard, AC vents and dials. The all new 2016 Skoda Superb features Black Decor with Ambient lighting, power-adjustable front seat with memory and lumbar support, boss button and 12-way adjustable driver seat, panoramic sun roof, parking sensors, Apple CarPlay and Android Auto facilities, automatic headlamps and wipers among several others. There are abundant safety features which you can find in 2016 Skoda Superb. 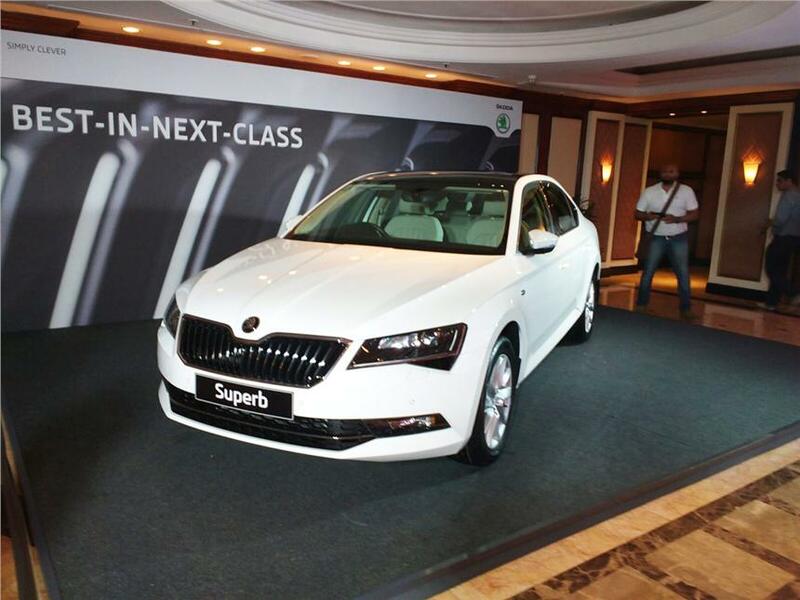 The 2016 Skoda Superb comes with 9 airbags, Electronic Brake-force Distribution (EBD), Brake Assist (BA), Anti-Lock Braking System (ABS), Electronic Stability Program (ESP), Traction Control System (TC/TCS), Engine immobilizer, remote central locking, Child Safety Lock, tyre pressure monitoring with optional Rear Traffic Alert, Traffic Jam Assist, Blind Spot Detection, Adaptive Cruise control, Lane Assist and Fatigue detection. The rivals for all new 2016 Skoda Superb are Volkswagen Passat, Toyota Camry, Honda Accord and the car has all the charisma to give competition to some of the luxury sedans like Mercedes-Benz CLA and Audi A3. Also read: Skoda VisionS shows the future of Skoda’s SUV portfolio.